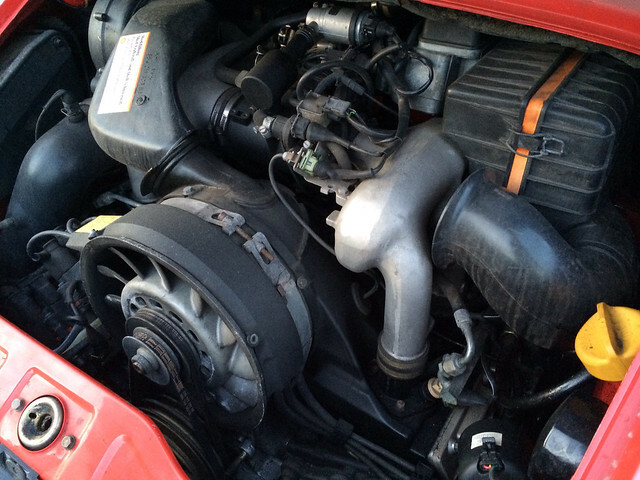 Posted: Wed Mar 25, 2015 5:28 pm Post subject: My 964 experience.. I have taken a bit of a turn from the usual direction I go with my choice of car and ended up buying something that kind of scares me. Normally I know a car in and out before I buy it, having spent months doing research etc etc. 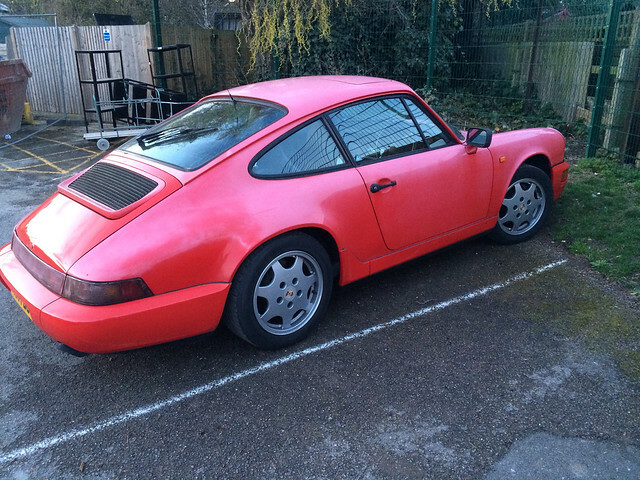 Well, I have to admit, I know literally nothing about the workings of a 964, it is the oldest car I have owned, (An L reg was previously the oldest and that is my current MX5 skid car and an old Volvo T5, don't ask..), it is my first experience with an air cooled car and just a car I never thought I would own, always liked them but always been scared. So, I was about to buy a 996 which was an impulse decision, no need or want for it, just a convenient local purchase.. Before I bit that bullet, I happened to think of an old friend I knew through work, I remember doing some work at his place of work which was a weekly thing and one day, him telling me with glee that he has just bought a Porsche, outside stood this Guards Red 964.. Iconic car and paid a measly £13k for it (7 years ago)... Fast forward and I decided to text him, simply asking, "do you still have the Porsche. A reply comes in, "YES WHY? ", I get straight to the point, "Do you want to sell it", he replied with, "Come down and let's talk". 5:30 rolls round and straight from the office, I shoot to his place, I see the 964 looking a tad sorry for itself.. Out comes Dave and a tour begins.. Car starts on the button and is used at least once a week, sounding healthy, I get taken for a spin in it and wow, this thing feels better than my 997, so solid after so many years. She is a tiptronic (Not my choice but couldn't say no) with 79k miles, loads of paperwork, loads of recent work performed, looked after heavily (mechanically), the interior is 100%, exterior just needs a polish although there are 2/3 very light rust bubbles on the wing edges and the spare boot lid is white so I can see myself booking this in for a full repaint. I could go on but I'll let the pics do the talking! I really want to learn what options it has and how to do a few things.. Things that are wrong, tyres are old, heater does not blow hot air and rear wiper seems to be jammed, otherwise it's just minor bits, mechanically its solid, regular oil changes, new tiptronic fluid along with some replaced pipes, healthy brakes.. Cant wait to get stuck in. Thought I'd share and keep a diary like I do with my 997, link below. 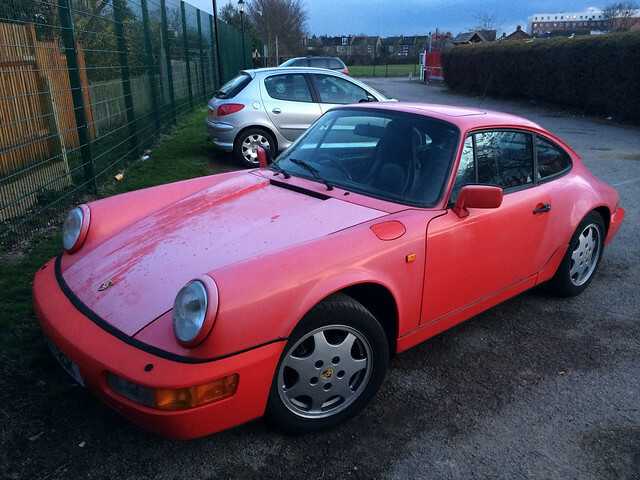 Oh that's fantastic!...If it was mine I would get it mechanically perfect and leave the paint as is..money can't buy what time has done..looks awesome..
Posted: Wed Mar 25, 2015 5:58 pm Post subject: Re: My 964 experience..
...... exterior just needs a polish although there are 2 rust scabs and the spare boot lid is white so I can see myself booking this in for a full repaint. From those pics it looks like a full respray is required. The good news is that I'm certain you'd get your money back and probably a lot more. The rest of the car looks very nice. Whatever, 'Congratulations' on what looks like a terrific find and well done for posting the story. Congrats. Always loved the 964 and they look better than ever. Looks like we have found the next Magnus Walker.... Nice little collection of 911's you are building there!! Everything is fixable. 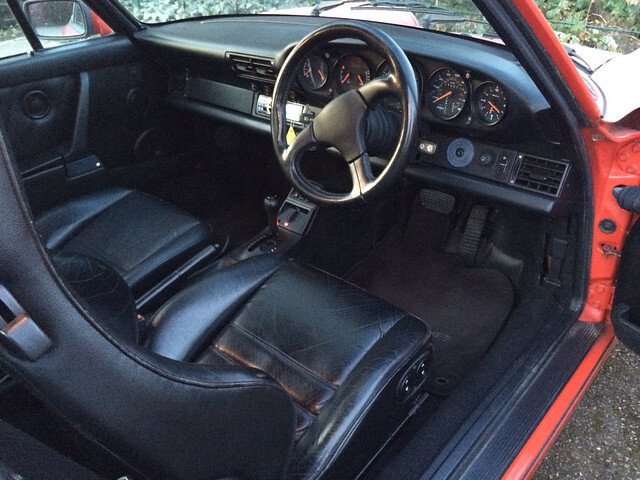 The things you mention are familiar to all us 964 owners. 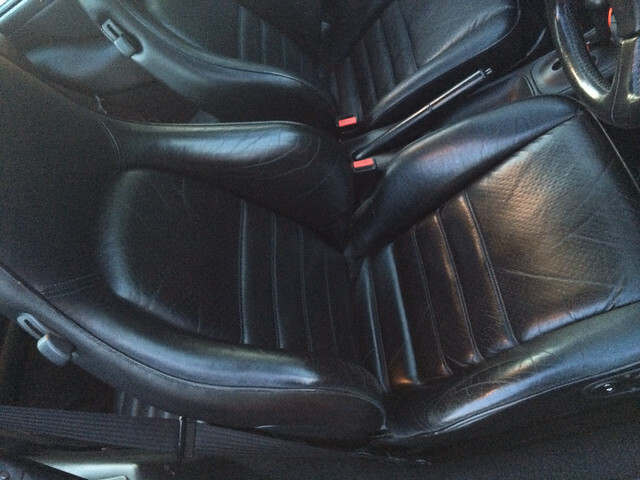 Posted: Wed Mar 25, 2015 9:25 pm Post subject: Re: My 964 experience.. I was scared and paranoid when I first got mine but once you get used to it you'll be fine. Posted: Thu Mar 26, 2015 12:48 am Post subject: Re: My 964 experience.. I'm happy to learn something new every day, Thanks. I am fully confident that I will have the paint looking the total opposite of what it does in the pictures once I have spent some time on it. The licked finger rub test reassured any doubts. I haven't got it in me to leave it with the patina'd look, perhaps if it had patches of rusty etc but as it stands, it just looks a bit pikey! Once I have got the car up to scratch, I plan on getting it into my good friends at Xquisite Automotive for a show quality paint job. They have always shown some amazing workmanship on my cars in the past, mainly my Golf which has won countless shows including best paint and 5 AutoGlym modified concours standard shows, so this 964 will be in great hands. I'm hoping they can magic a manual gearbox in there. I follow Magnus Walker on Instgram and noticed that he has recently started on a 964, I'm not so sure on his tastes so I'm sure it will end up looking like a patch work quilt, perhaps he could just buy mine or swap for one of his beautiful 930 T's! Thanks Chief, I already have a list of questions and I haven't even got the thing yet, I don't even know what quantity and weight of oil it takes!! 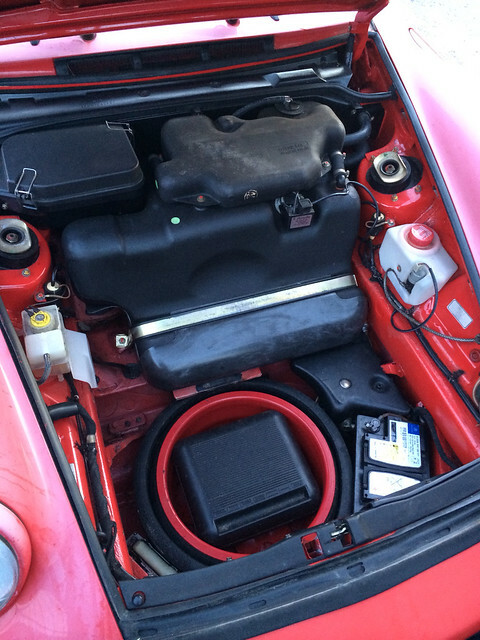 The first think you need to check is the 30 amp fuse in the triangular fuse box next to the hot air blower in the engine compartment. It's likely blown or has a 25 amp fuse which will definitely have blown (Porsche uprated the fuse to 30 amp soon after they realized the issue). p.s. please don't slam it! Thanks! That will be the first thing I check once it's home. I don't think I will be slamming this, I would like the take the front end down a touch however, I heard that the front shocks have some height adjustment in them, is this true? I would love to save myself the effort but I just cannot leave the paint how it is, it goes against everything I do when it comes to cars. Are there any recommended upgrades I should make to this? I am itching to buy bits and pieces but not sure what it needs/what is advised. I would be the same, would be ace to keep but how much better will that car look when the paint is immaculate. With your attention to detail it will be a brilliant example. I would like the take the front end down a touch however, I heard that the front shocks have some height adjustment in them, is this true? Not if they are the standard shocks, so no. You're certainly on the right forum. Don't get to worried about engine leaks unless it going on you drive, lot's of gaskets and rubber seals getting crazy hot and causing leaks!